I don’t know about you, but I am always sent home from Easter dinner with lots of leftover baked Ham. Sure, it’s tasty just on it’s own, but it’s even better on a bagel. This has to be one of the most simple recipes in the world. If you know how to make eggs, and toast a bagel, you can do this! Slice the bagel and lay it on a baking sheet, cut side up. Preheat your oven to 400 degrees, and put the bagels in the oven. Heat 1 tsp of butter or oil in a small fry pan. Once melted, crack 1 egg into the pan. Add Salt and Pepper to taste. Using a fork, break up the yolk (but don’t scramble!). Leave it until it’s almost cooked, then flip the egg and let the other side cook for 30 seconds to 1 minute – just until done. Remove the egg, and to that same pan add the slice of leftover Easter Ham. It should only take 2-3 minutes to heat through, flipping once. Remove the bagels from the oven (they should be nice and toasted by now). Put two slices of cheese on each half of the bagel. 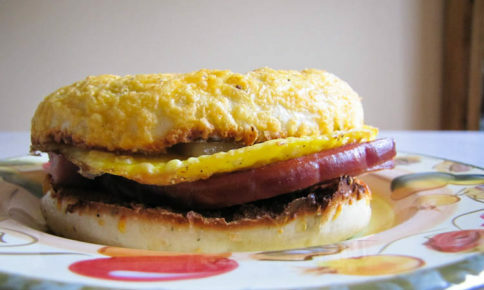 Add the ham and egg to one side of the bagel, and top with the second half. The warmth from the bagel will melt the cheese, and by putting the cheese on both sides it sticks the ham and egg to the bagel, making it easy to eat! If you want to spice things up a bit, add some fresh herbs to your eggs, some minced garlic, or some thinly sliced tomato. Add some lettuce to make it a B.E.L.T (Bacon, Egg, Lettuce and Tomato Sandwich). If you can’t finish it all in one sitting, simply wrap it up in saran wrap and keep in the fridge for up to one day. Very filly and very tasty! I just happen to have some left over ham…now do I also have a bagel??? The picture has made me hungry. Thanks for sharing!